Motorcycle racing is all about grip and traction. That’s all that really matters, because everything is worth zilch unless you can transfer it to the racetrack. You may have the fastest engine, the best brakes or the sweetest-handling chassis, but none of these things mean much unless you have the grip to exploit them. This is the reality in MotoGP now more than ever. And this is one reason why MotoGP is so unpredictable. On Sunday, Andrea Dovizioso topped the Brno podium after finishing a fraction ahead of Jorge Lorenzo and Marc Márquez in the eighth-closest finish in premier-class history. This was the first time the trio has appeared together on the podium this year. Indeed the same three riders haven’t appeared together on the podium once during the first 10 races of 2018. Compare that to the Bridgestone control-tyre era, when more often than not the same groups of riders – Casey Stoner, Dani Pedrosa and Jorge Lorenzo, or Márquez, Valentino Rossi and Lorenzo – stood on the podium with monotonous regularity. How come? Because Michelin tackles MotoGP in a very different way. This, plus the similarity in performance between the 'bikes, is what’s created racing that’s almost impossible to predict. 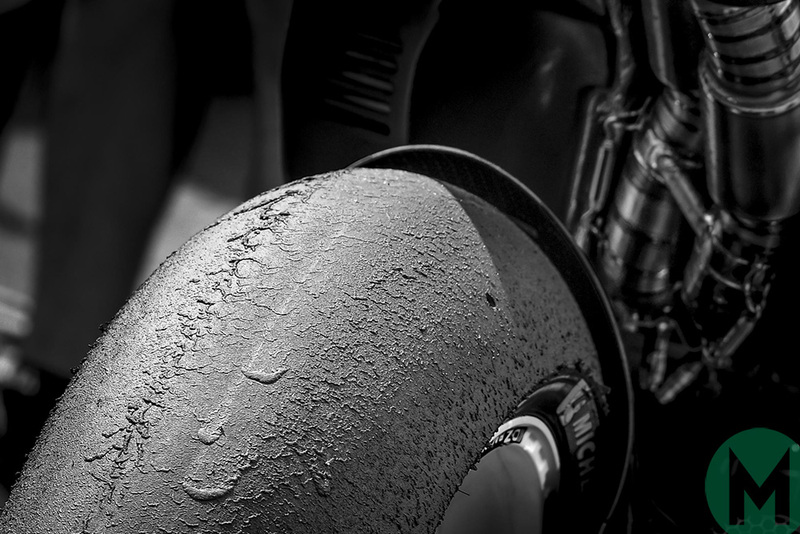 First, Bridgestone brought three different front and rear slicks to each track to cover all possible temperatures, thus there was a marked difference between the soft, medium and hard, so most riders usually chose the exact same tyres for the race. Michelin also aims to cover all conditions, but its three compounds are much closer together because the French company wants all of those tyres to be potential race tyres, each helping different riders get the best out of their 'bikes. So a greater variety of tyres usually gets chosen for the race, which makes the racing more exciting, because every rider has an advantage in different parts of the track and at different stages of the race. Second, the performance window of each tyre is narrower, which increases the unpredictability of the result, because it’s not easy to find the ideal set-up to generate the best grip from each tyre, so no one can be certain which choice is the best until the chequered flag is waved. Third, the Michelins are friendlier than the Bridgestones, so more riders can take them to the limit more often, at least when they find the right set-up. Fourth, tyre management is a vital skill with the Michelins, because riders need to save enough rubber for the final laps, which is what helps keep the pack so close together at many races. This was very much the case at Brno, where the extreme heat had the lead group riding as smoothly as possible over the first 16 laps, then unleashing hell with five laps to go, when they were confident they had enough grip to fight to the finish. However, it’s not so much a case of the tyres running out of grip, if the riders are clever enough, because Dovizioso, Lorenzo and Márquez all rode their fastest laps on the final lap. Last year Dovizioso was the master of tyre management. “We understood how to manage the rear tyre and that was one of the keys of my 2017 results,” says the Italian. “Now in MotoGP every rider is really, really fast, but less than half the grid is able to be fast and save the tyres. The way to win races is different now and it’s not always the same story: sometimes you have to save the tyres from the start of the race, sometimes you can push harder from the start. Every time it’s different; it depends on which tyres they bring. Many races, especially Sunday’s, in the thick of a European heatwave, are all about saving rubber for the final push. Riders must think harder than ever about their tactics and also about their riding technique, adapting at each track to eke the maximum from the tyres, as did Lorenzo at Brno. Is this a good thing or a bad thing? Some would say it’s bad that riders can’t keep it pinned from lights-out to chequered flag, but many riders and crew chiefs like the current situation, because they feel that can gain an advantage if they think harder and work better than their rivals. And all the riders enjoy close racing and battling with their rivals. Dovizioso’s crew chief Alberto Giribuola believes his rider’s stop-and-go technique is the best way to save the rear tyre, which helped him win at Brno and at the season-opening Qatar GP. Danilo Petrucci – who spends plenty of time examining the data of fellow Ducati riders Dovizioso and Lorenzo – agrees with Giribuola’s analysis. Márquez isn’t so much the master of tyre management as the master of choosing the best tyres and then squeezing the maximum out of those tyres. This is why it’s very rare for anyone to win more than two races in a row, because however well a rider, his 'bike and his tyres may go at one track, the next track may be completely different. “With the Bridgestones we nearly always raced with the medium front and the soft rear, so everybody was using the same tyres,” says the reigning world champion and current points leader. “Now we all have a lot of options. At one race some riders choose the soft rear, some go with the medium and some with the hard, and everybody is fast! This is one of the good things with the Michelins. Dovizioso agrees with Márquez – you need to keep your cool and use your brain to get the best out of the Michelins. This is the magical mystery of the Michelins – it’s not at all easy to find the best race tyres and then keep them working all the way to the chequered flag – which makes life more difficult for everyone on track and in pit lane, but much more fun for everyone watching from trackside or at home. This season Michelin will offer about a dozen different front slicks and around 20 different rears across 19 races, each of them very particular. Other times riders know before practice even starts that they are in trouble. For example, when Márquez studied the allocation before Mugello he immediately knew that the front tyres on offer wouldn’t work for him. Sure enough, he lost the front and crashed in the race. Giribuola is one of many engineers who enjoys the process of putting together the pieces of the jigsaw each weekend. So how come Dovizioso has scored just three podiums from the first 10 races of 2018? Michelin hasn’t changed its profiles or constructions since last year, but the company is using softer compounds (because the hard rear was rarely a popular choice during 2017), which some riders say has slightly reduced grip. Dovizioso believes it’s either that or a minor error in set-up that’s caused him trouble this year. Dovizioso’s first win since Qatar – where all the top riders used Michelin’s latest soft-mix soft compound – suggests that the world number two and his crew may have worked out how to get better race-long performance from Michelin’s 2018 rear. The 2017 runner-up has a long way to go if he’s to catch Márquez (68 points, to be exact) but if he wins again at the Red Bull Ring, which is basically an Alpine drag strip that seems to have been designed precisely for the Desmosedici, he could be in with an outside chance.